Oxford House is an accredited language school in Barcelona that is passionate about and dedicated to language learning and teacher training. It was founded in 1998 by Duncan Foord and Nick Rawlinson, two English teachers that had worked in Barcelona as teachers, directors of studies and teacher trainers since the early nineties. In 2002, a second centre was opened in Prague in the Czech Republic. Our school in Barcelona is centrally located, well resourced, spacious and comfortable. The atmosphere within the school is professional, dynamic and relaxed which makes it an ideal place to study. We attract people from all around the world who would like to learn a language or teach English for a variety of reasons. Our ongoing support to all of our departments, staff, students and teachers brings people together, motivates and promotes the desire to share a positive attitude. We are innovative and constantly seeking to improve our service, listening to our students, our staff members and developments in the field of language learning or teaching. We are proud to say that this has resulted in a steady growth in our company, and our loyal students continue to recommend us to those around them. Our courses are practical, flexible and challenging and forever providing opportunities to learn and grow. They are internationally accredited so that our students can achieve a recognized qualification and demonstrate their success to themselves, employees, friends, family and the world. Would you like the chance to look around the school before actually coming and visiting us in person? Check out this virtual tour of our premises, just one minute from Passeig de Gràcia! 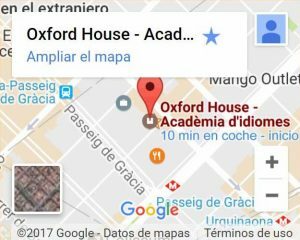 Oxford House is our language school in the Eixample Dreta neighborhood of Barcelona where we provide language courses and private classes in Catalan, Spanish, French, German, Italian, English and other languages for adults, children and teens. We also organize activities for practicing languages. Our Business Language Department coordinates all of our language courses and linguistic services for companies in and around Barcelona, as well as in other cities in Spain. Oxford TEFL is our English teacher training centre, which is very well known in the world of TEFL (Teaching English as a Foreign Language). Do not hesitate to visit our centre to find out more about our courses.